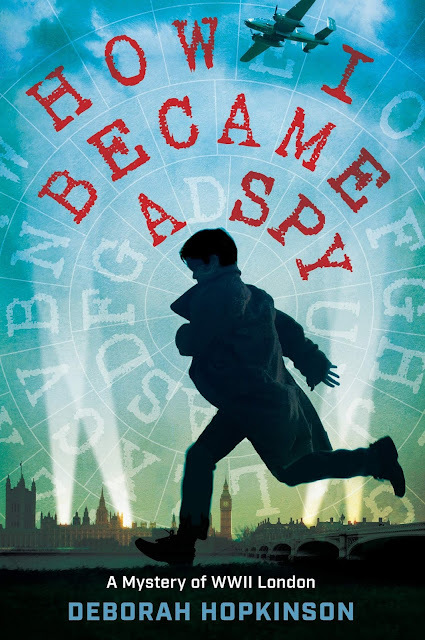 I never get tired of books set during WWII, and with How I Became A Spy: A Mystery of WWII, Hopkinson, a marvelous, prolific author of non-fiction and historical fiction, brings a new twist to her story. It's 1944 and thirteen-year-old Londoner Bertie Bradshaw is a newly minted civil defense volunteer when, during a bombing raid, he discovers a lost notebook and an unconscious woman. As Bertie puts the pieces together, he comes to realize that this notebook probably belongs to the young woman he found unconscious in the street, and that young woman is probably a spy! Bertie reads as much of the notebook as he can - half way through the author switches to writing in code - and tries to piece together the few clues he can find. As Bertie and his dog, LR, a spaniel adopted when her owner left London and trained as a rescue dog, search the city for clues, they encounter new friends and potentially dangerous enemies. Thirteen-year-old American Eleanor Shea, in London with her father, a literature professor working for the OSS, is the first to connect with Bertie, adding layers to the mystery. Unable to decode the notebook on their own, Bertie convinces Eleanor to let his friend David Goodman, one of the nearly 10,000 mostly Jewish children evacuated to England before the start of WWII, to help them. A huge fan of Sherlock Holmes, David's foster family also happens to be friends with Benjamin Marks, owner of Marks & Co. (made famous to book loving Americans by Helene Hanff's novel 84 Charing Cross Road, made into a play and movie starring Anthony Hopkins). While visiting Marks & Co., the three run into Leo Marks, Benjamin's son and also a well known cryptographer working for the OES. As the three decode the notebook, they realize the young spy who kept it had uncovered a double agent and set a trap to reveal this person and prevent more British agents from being captured and killed, and worse. They quickly realize that, not knowing what happened to the owner of the notebook, it's up to them to catch the traitor and set a risky plan in motion. Hopkinson's work as a non-fiction writer allows her to add layers to this book that make is even more fascinating and also a standout among WWII books for young readers. One small but standout layer of How I Became a Spy is the character of Warden Ita, inspired by the real person, E. Ita Ekpenyon. A native Nigerian, Ekpenyon moved to London and volunteered as an air-raid warden and wrote a brief memoir about his experiences. As Bertie, Eleanor and David research and crack codes in the story, Hopkinson gives readers the opportunity to learn these same skills! There are four "Spy Practice" sections in the book where Hopkinson introduces readers to different kinds of ciphers and how to use them while also giving them challenges - answers in the back. Adding historical context, each chapter begins with a quote and Conan Doyle's Sherlock Holmes, the real book - SOE Manual: How to Be an Agent in Occupied Europe, and a passage from Between Silk and Cyanide: A Codemaker's War 1941-1945 by Leo Marks are among the fascinating sources Hopkinson draws on. I was Googling every few pages to learn about people and places mentioned in How I Became a Spy, as I read about Telek, Heywood Hill and the time Nancy Mitford worked there, and more. Back matter also includes information that puts the history into further context for readers and hopefully inspires them to learn more!